The Cowboys tight end will join Longhorns pitcher Greg Swindell in Waco on March 30. WACO, Texas — A former Dallas Cowboy tight end known for his durability and reliable hands will be inducted into the Texas Sports Hall of Fame in Waco on March 30. Jason Witten holds the most receiving yards record in Dallas Cowboys history, with 12.448 yards and holds the franchise's record for most receptions in a game, with 18. He had a lengthy career, which began in 2003 after he was selected in the third round of the National Football League's draft. Witten only missed one game. This is perhaps the most impressive stat: 229 consecutive games played as a Cowboys starter and the most games played in Dallas Cowboys history, with 239 games. 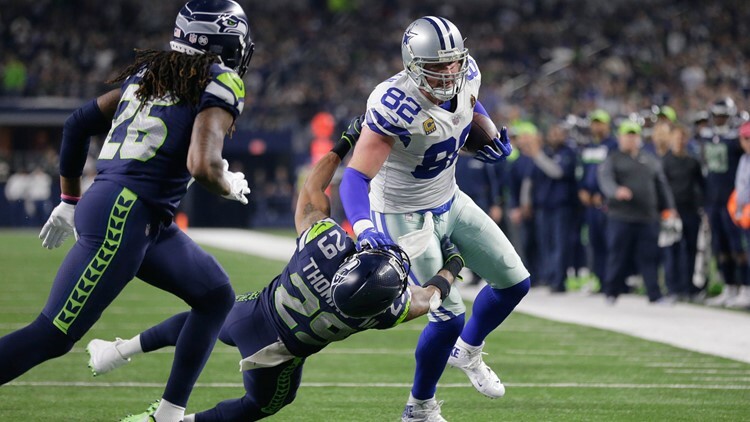 Witten's one missed game in his 14-year career was due to a broken jaw. He retired in 2018, but remains active as an NFL analyst for ESPN. Witten will be enshrined into the Texas Sports Hall of Fame in Waco, along with legendary Longhorn and retired MLB pitcher Greg Swindell. Joining Witten and Swindell as members of the Texas Sports Hall of Fame class of 2019 are Maureen Connolly Brinker , Andre Johnson, Nancy Lieberman, Loyd Phillips and Tony Franklin.